2018/03/02 Welcome to Join Korenix Seminars in Australia for Free! Korenix will have free seminars in Australia! You are welcome to join! 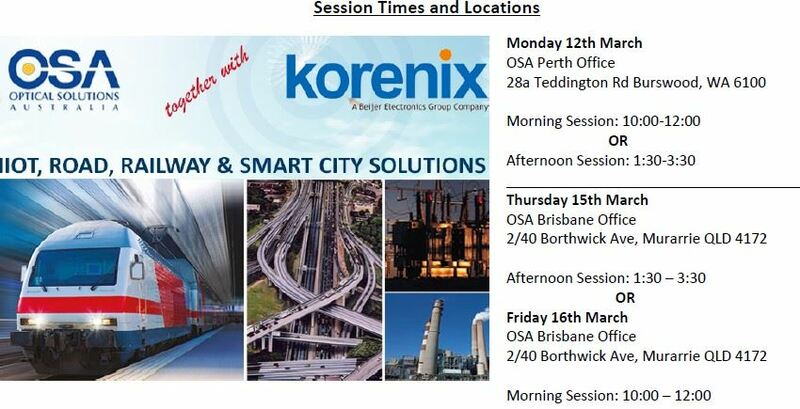 Korenix is honored to collaborate with Australia ‘s leading network solutions and distribution company –Optical Solutions Australia(OSA)—to have several seminars in Perth and Brisbane. The topics will cover market trend of IIOT, construct SMART city, and new technology..etc. It will be a good opportunity to gain knowledge about networking solution, and to have a face-to-face discussion with Korenix.